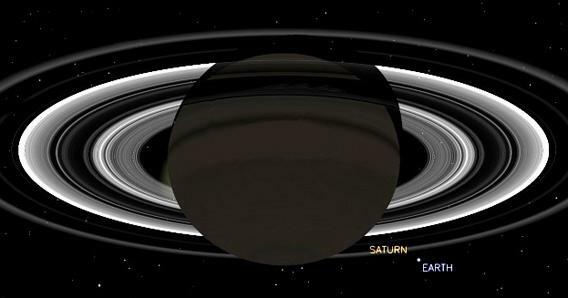 Saturn and Earth: Cassini spacecraft will take pic of both worlds in July. Look at Saturn and Say Cheese! The spectacularness of Saturn, with Earth hanging in the distance. This mosiac was taken by the Cassini spacecraft in 2006. Click to encronosenate. If you’ve ever wanted your picture taken from more than 1 billion kilometers away, here’s your chance. On July 19 between 21:27 to 21:42 UTC (5:27–5:42 p.m. EDT), the Cassini spacecraft will be pointed toward Earth for a series of what will no doubt become iconic pictures of Saturn and our home world together. The images are being taken as part of a giant mosaic of Saturn that will be captured by Cassini. The spacecraft orbits Saturn and over the course of four hours will be in a part of its orbit where the disk of the planet itself will block the Sun. Cassini will see the rings backlit, the planet dark, with perhaps a halo of light circling the disk due to sunlight scattered by its atmosphere. Illustration of Cassini’s view of Saturn during the planned observations. But just off to the side, a bit below Saturn’s face, will hang the pale blue dot of Earth, 1.45 billion kilometers (900 million miles) away. Even from that terrible distance, Cassini’s cameras should be able to detect the Earth’s Moon as well. 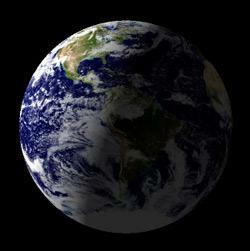 Cassini’s view of Earth during the planned observations. In reality, the entire planet will be about 2 pixels across. Click to gaianate. Now, to be clear, the entire face of our planet will be at best 2 pixels in size from Cassini, and the Earth is roughly 100 million times wider than your face. You’ll be, um, unlikely to recognize yourself. But when the final picture is put together, you’ll have the knowledge that when Cassini was looking at you, you were looking right back. The final image should be spectacular. The picture at the top of this post was taken in 2006 and shows what it looks like when the Saturnian system is backlit by our star. 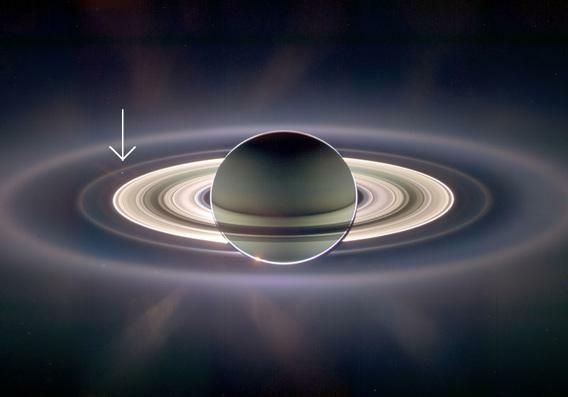 Earth is in that shot (indicated by the arrow), a tiny blue bit just outside the bright main rings. (A similar shot was taken in 2012, sans Earth.) It made quite a splash (I picked it as my top picture of 2006, which proved so popular it jammed the Cassini Web servers at the time), and for good reason. It’s gorgeous, it’s weird, and it gives us a sense of just how remote and lonely and wonderful and audacious our exploits can be. Cassini is a plutonium-powered school-bus-sized robot that’s been orbiting Saturn for nearly a decade, and we put it there. That’s reason enough to take a moment and celebrate what we can do. And if you don’t believe me, read what Cassini Imaging Team Leader Carolyn Porco has to say about this. It’s inspiring. The science Cassini does is astonishing, and we’ve learned more about Saturn in the past decade due to it than we had in the previous century. Scientists will be studying that data for the next century to come … but even so, it’s not all about science. Sometime it’s OK to stand back, admire the art, and realize that it can be about us.